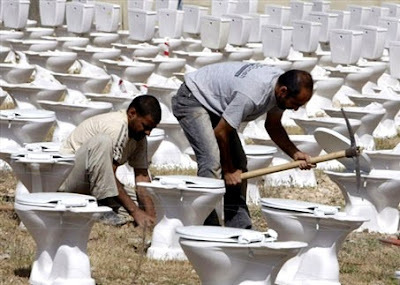 Beirut : Workers place porcelain toilets in a field in central Beirut on April 11 2008 for a display marking thirty-three years since the outbreak of a war in 1975 that devastated Lebanon for 15 years. The Lebanese Association for Human Rights organized a number of events, including this display of 600 toilets in an open field in the centre of Beirut entitled "Haven't 15 years of hiding in the toilets been enough?" Lebanon's Civil war started on April 13 1975 and ended with in 1990, leaving more than 150,000 people dead.